Participants in the 2013 Leavenworth Oktoberfest Half-Marathon take off from the U.S. Fish Hatchery. LEAVENWORTH — In the end, runners were offering to pay for the full marathon just so they could run the half. Such is the success of this Saturday’s Leavenworth Oktoberfest Marathon and Half-Marathon. The 10th-annual event sold out several days ago at 1,900 half-marathoners and 350 marathoners — a development that saw potential participants scrambling to get in during the final days. The last year Leavenworth sold out was in 2012. 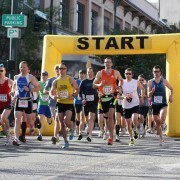 A year ago, about 1,900 runners took part. 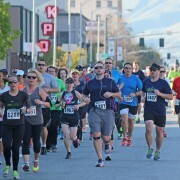 The Leavenworth Oktoberfest Marathon and Half-Marathon courses take runners through Waterfront Park along the Wenatchee River. 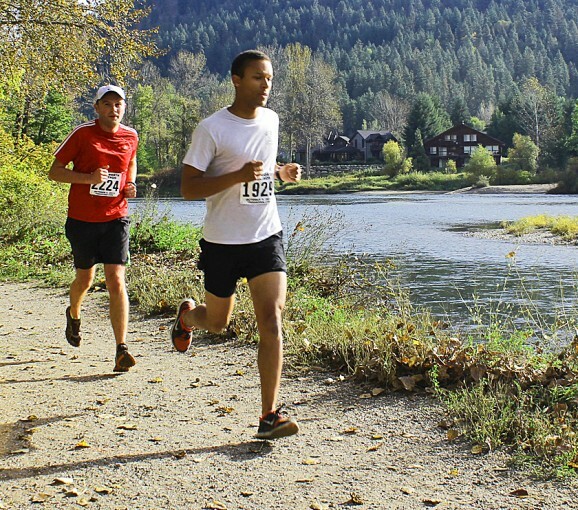 The race is held in conjunction with the Oktoberfest celebration in Leavenworth’s Bavarian Village. Other than the larger field, the event should look similar to last year’s race, with both courses remaining the same. The marathon starts at 7 a.m. on Icicle Road in the Wenatchee National Forest and the half-marathon begins at 9 a.m. at the U.S. Fish Hatchery in Leavenworth. Both races finish at the fish hatchery. Packet pickup will be held from 4 to 8 p.m. Friday at the fish hatchery and again from 5 to 8:30 a.m. Saturday at the same spot. Buses for the marathon start will leave from the fish hatchery from 5:45 to 6:15 a.m. Saturday. Private cars are not allowed at the marathon start. East Leavenworth Road will have one lane closed to traffic from 8:15 a.m. to 1 p.m. Saturday. Finegold said the best spectator spots also should in and around the fish hatchery. The half-marathon starts there and both races end there. 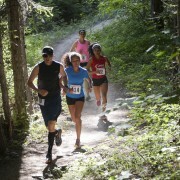 Spectators also can walk to nearby Icicle Road to see runners from both races go by. TedDriven is asking spectators to not drive the course during the event. In addition, parking is not allowed on the shoulder of Icicle Road and vehicles could be ticketed or towed. Meanwhile, at 7:30 p.m. Thursday at Sleeping Lady’s Salmon Gallery/Chapel Theater, a cancer researcher with long ties to the Leavenworth marathon will speak about her cutting-edge cancer biology lab at the University of Pennsylvania. The lab studies ways to fight solid tumors genetically and to identify new targets for treatment at the cellular and molecular level. The cost to attend the lecture is $15. Tickets can be obtained by calling 800-574-2123 or 509-548-6344. The Leavenworth marathon has donated money to Ryeom’s lab for several years. TedDriven is named after the late Ted Finegold of Wenatchee, who co-founded the Leavenworth race and succumbed to the disease in 2010.